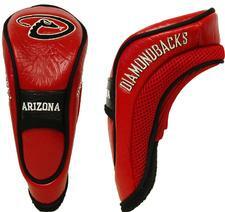 MLB Hybrid Headcover (Select Teams Available) - $18.95 - GolfersEdgeOnline.com - Best Golf Equipment On The Web! Deck your bag out in team spirit with the Team Golf MLB Hybrid Headcover. The combination of buffalo vinyl and acrylic mesh, a Velcro closure, and fleece lining creates the perfect protection for your club. Official team wordmarks and logos embroidered on this team-colored headcover show your college spirit as you hit the course in support of the home team. If you have any more questions about the MLB Hybrid Headcover (Select Teams Available); do not see the model you are looking for; need custom options; or prefer to not purchase online, then please call us at (630) 656-1291.